Prom oting a love of Science, Technology, Engineering, and Mathematics (STEM) is a passion for many of our professionals. 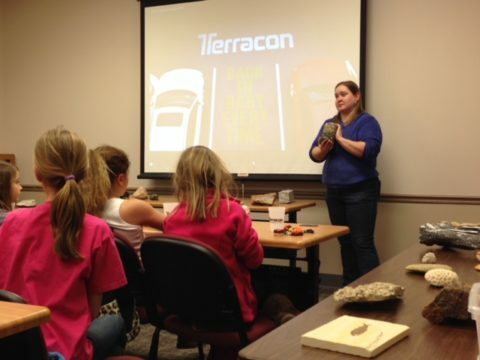 For Terracon’s women in leadership, outreach is often very personal as they encourage more girls and women to follow them into STEM careers. Whether it’s conducting hands on activities related to water sampling, participating in job shadowing, acting a Big Sister mentor, or speaking to a scout troop, our women in leadership are making an impact with the next generation. Thanks to Catherine Rocky, P.G., E.I.T, C.P.S.M., senior associate and national accounts manager, as she shares the STEM activities of Terracon women across the country. Irvine: Melanie Seydel, staff environmental scientist, has been active with the Society of Women Engineers (SWE) collegiate chapter at Cal Poly San Luis Obispo, working with local schools, Girl Scouts, and perceptive students, engaging them in age appropriate activities, including hands-on activities such as constructing parachutes, paper airplanes, catapults, paper towers, and bridges. Another outreach highlight for Melanie was Fourth Grade Days during the National Society of Professional Engineer’s (NSPE) Engineering Week (E-Week), reaching out to a record number of 28 classrooms in four days. Orlando: Leila Jammal Nodarse, P.E., senior principal, serves on the University of Central Florida (UCF), College of Engineering Foundation Board and serves as a mentor to a new female board member. Leila has spoken to many of the classes at UCF as well as the Leaders Up Close series where she told her story of starting her engineering career which then led to founding an engineering business, Nodarse & Associates, now a Terracon company. Leila found the women in the class were interested in the work-life balance and took comfort in hearing that she has found the engineering profession is one where women can have both. Leila also finds time to talk STEM with Girl Scouts, a group she feels especially connected to as she credits the organization with developing her entrepreneurial spirit at a young age through cookie sales. Des Moines: Anna Smith, E.I., project geotechnical engineer, has volunteered for the ASCE booth at the Girls In Science, held at the Science Center of Iowa, and the Believe in Girls (B.I.G.) event hosted by the Girl Scouts. Lenexa: Sara Somsky, P.E., senior geotechnical engineer, has been involved with STEM volunteering opportunities through ASCE, NSPE, and the National Association of Women in Construction (NAWIC), participating in MathCounts, Block Kids Building Program, and the annual Bridge Building Competition sponsored by Kansas Society of Professional Engineers. 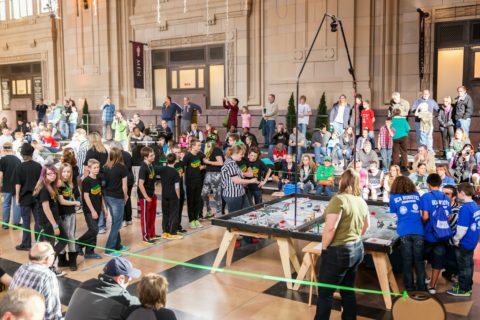 She has also volunteered with the First Lego League through the KCSTEM Alliance. Sara noted these types of opportunities allow engagement with the students to discuss what design features on the structure work well and what can be improved the next time. Wichita: Heather Rogers, E.I.T., environmental engineer, is a mentor for the Big Brothers Big Sisters’ STEM program, and also serves as a judge for design events, and volunteers in many STEM outreach activities with the organization including a CAD workshop, the Wichita SWE Engineering Expo planning committee, and continuing the Rocks and Dirt demonstration booth started by Terracon 12 years ago. Heather has also helped fellow SWE members coach a competitive Lego robot team of Girl Scouts. The office also hosts events supported by SWE. 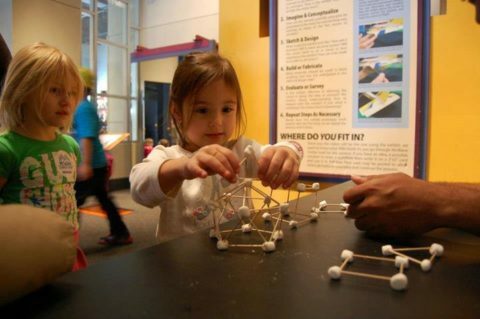 St. Paul: Cami Van Abel, P.E., senior engineer, actively serves the Minnesota chapter of the SWE and specifically the E-Week celebration at the Minnesota Science Museum. Outreach events include the Wow! That’s Engineering program aimed at educating young girls in the Twin Cities. Manchester: Muriel Robinette, P.G., senior principal and senior environmental hydrogeologist, has been a guest lecturer at her daughters’ science classes in middle school, dressing the kids in Tyvek, and doing hands on activities related to water sampling (using bailers and taking water quality readings). Muriel has also been job-shadowed several times in the past 10 years and judged design events. 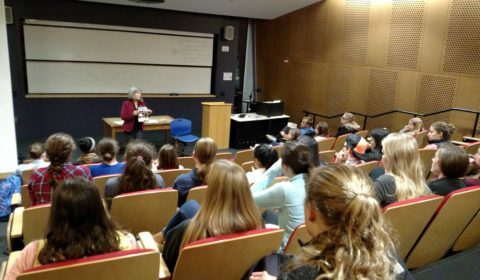 She is on the Board of New England Women in Energy and the Environment, which promotes networking and job shadowing for young women interested in STEM careers. Cincinnati: Nancy Dendramis, P.E., A.M. ASCE, senior staff geotechnical engineer, served as an adjunct professor in the engineering department at University of Cincinnati. Nancy is a past president of her local ASCE section and part of a STEM team assigned to high school classroom presentation responsibilities. Her role has included presenting a geotechnical engineering solution for the Billy Mountain landslide event in Utah. She also serves on the National Board of Trustees for the American Heritage Girls, helping with the development of the Engineering badge. San Antonio: Laura Campa, P.E., principal and materials department manager, is regional vice president of the Bexar Chapter Texas Society of Professional Engineers (TSPE), local chapter of the NSPE. She’s is the founder of the Nerds 5K, one of the largest E-Week fundraisers, and participated in the Engineer for a Day program. Laura also volunteers at various state and local Mathcounts events. Laura also finds time to serve on the University of Texas at San Antonio College of Engineering Advisory Council, attending various student group activities including luncheons which provide opportunities for professionals and engineering students to interact. Cheyenne: Ayna Kekilova, project environmental engineer, shared her Russian native language and everything she could about engineering with a 12-year-old girl interested in environmental studies engineering. Author: Catherine Rocky, P.G., E.I.T, C.P.S.M., senior associate and national accounts manager has more than 30 years of experience in consulting and government in environmental engineering. She is a member of SWE, SMPS, and past president of the Wichita Council of Engineering Societies.